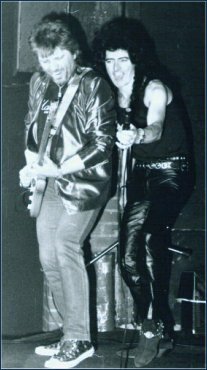 In the beginning of the 80’s Andy produced some demos for a NWOBHM band called Weapon who were fronted by Danny Hynes. Later in the mid 80’s he formed a new band called Paddy Goes To Holyhead. He got up and play with them occasionally. This lead to Andy producing and playing on some songs including a single. They went into London Bridge Studios record The Green Green Grass of Home and he was invited to join the band on a more permanent basis, which he did until the Sweet went back on the road full time.